When we have telepathy, who will own your mind? Who owns your social graph? According to Super Bowl fans, anyone can. According to Forrester Research, only your employer — or at least your boss owns a big chunk of your personal human network. We’ll start with football. 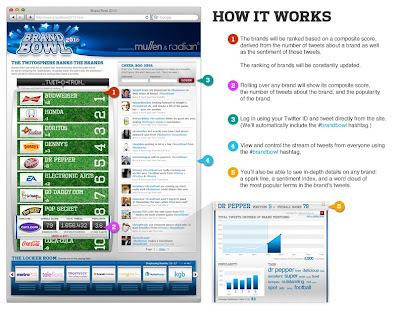 On Sunday ad shop Mullen and social-tracking service Radian6 captured up to 0.7% of all tweets with their clever BrandBowl 2010 advertising portal. The site, if you missed it, used Radian6 monitoring to rate chatter about Super Bowl ads. But beyond buzz, BrandBowl also illustrated an agency and software firm co-opting the Super Bowl social experience. What did Mullen and R6 really do? They didn’t take over the sports brand. And this wasn’t about content. They borrowed someone else’s audience. And if you think about it, far more than a brand or product, an audience is the most valuable thing anyone can create, because only your customers are a source of inflowing value. Social networking has destabilized customer bases because now anyone can find a way to pull an audience to their own hub. In the past, the only way to watch a national football game was to dial in to the correct TV channel; today, Twitter, Facebook, YouTube, Vimeo, LiveFyre, and soon Google Social Gmail create fluid hubs that carry conversations elsewhere. A smart marketer has an opportunity to build an axis that spins another brand’s existing audience. Or, in financial parlance, it is now possible to steal someone else’s customer stock portfolio. Many businesses with customer equity, such as Forrester, aren’t keen about this. When the superbly talented Jeremiah Owyang left Forrester last year to move on to a consulting role, Forrester asked his replacement, Augie Ray, to shut down his prior marketing blog and only post comments related to marketing on the official Forrester sites. It’s hard to peek behind Forrester’s curtain but outside data shows traffic to its main web site down about 50% from summer 2009, so we understand why Forrester is building a wall. Augie appears happy to do so and has defended Forrester’s policy as a basic intellectual property agreement. According to 20th century business logic, Forrester is absolutely right. IP produced by employees, or even the client roster an employee builds while working there, should belong to Forrester. But the real question of Forrester’s wall is not who owns content or IP, but who controls an audience. Augie’s past blog, according to Quantcast, reached about 1,200-2,400 users per month — not a large crowd, but likely highly influential in the marketing industry. The real risk for Forrester is Augie becomes the next go-to social media star like Jeremiah and then leaves, taking his fans with him. So who is right? If the issue is not your product (services, methodology, thoughts, blog writing) and really your audience network, should a brand be able to own that as well? What if the audience is following your persona as the center more than the illusory corporate brand? It’s a serious issue because as networking technology improves, you, dear individual, will become the center of everything. Another Forrester ex-strategist, Charlene Li, has proposed social media will soon “become like air“. Imagine Facebook in the year 2030 when a chip in your ear and webcam on your wrist allow you to post videos of your every thought to everyone in the world, and social media approaches telepathy. Who owns your mind and its human connections then? And can you take your own brain with you when you change jobs? It’s been said open systems flourish and closed systems stagnate. Social media systems, on the other hand, simply rewrite the rules of business. If you want to learn if a $3 million pop on a :30 second spot while overweight men wrestle in spandex is worth it, social media can explain the reaction. Last year, for instance, Teleflora won the Super Bowl. The flower delivery service had a 14-fold lift in online mentions on Twitter after its ads ran during the big game, while chatter about many other brands that advertised went down. There are now scores of services that watch social media buzz, usually focused on quantity of chatter and “sentiment,” or whether the talk skews toward love or hate. On the plus side, it’s cheap consumer research; on the down, it remains to be seen if short spikes in consumer interest — such as the waves of response in social media that typically crest and fade within two weeks — really influence sales. Ken Burbary, digital strategist at Ernst & Young, has compiled a comprehensive list here, and many of the tools are free. It may be worth seeing how your brand scores among the public, too. Occasionally you read an insight so bright it hurts because you hadn’t seen it first yourself. That’s how we felt today reading Bill Green’s riff that the Super Bowl ads all failed because not one was as good as “1984” — the Apple TV spot that introduced the world to the Macintosh computer. So here we are, now in that big-screen future, and we get spots about racing cars and aliens pushing TV and guys crunching chips so loudly that girls’ clothes fly off. Bill lists nine total reasons why all these ads pale next to “1984,” and his last is most plaintive: Context. “You relate to an ad based on how your life is going,” Bill says, and if ever there were an opportunity to play savior against a dystopian disastrous environment, this is it. The global economy is melting, ice caps are soon to follow, the aging population is stressing social services, intellectual property rights are being tossed, bailouts may bankrupt our grandchildren, and that’s just the news on page A1. Maybe that’s why the latest Super Bowl ads fell flat. On the 25th anniversary of “1984,” advertisers missed a golden opportunity to offer a hopeful solution. Maybe Obama took the wind from their sails (the brand position for hope is filled). Maybe, at heart, creatives knew no current product is as inspiring as the original Mac (although we do dig that Audi). Still. Ad industry, it would have been nice if you had tried. Read Bill’s entire rant here for enlightenment. When Budweiser struck an exclusive deal with Super Bowl XLIII for beer advertising priced at $3 million per 30-second pop, Miller High Life was shut out. So in a genius end-run, MillerCoors cut a unique deal with local NBC affiliates who carry the game for them to run a series of 1-second spots. MillerCoors is building buzz for the campaign with an online backstory showing the logic — the guy in the series above riffs at length over why any idiot would spend $3 million for a single ad, and then brags he could convey the message in a second. The actual snippets that air may be the shortest ad buy in history, all while making the competition look slow. Brilliant. Hat tip to Sarah Ely. Why do Super Bowl ads cost 6 times as much? If we could have your attention, please, you might ask for a moment why the inflation-adjusted cost of a Super Bowl ad has risen from $4.79 CPM in 1967 to $30.77 today. Are advertisers spending 600% more because they’re desperate to reach consumers in one of the few remaining mass mediums? Well, yes. (CPM, for you non-ad types, is the cost to make 1,000 impressions on an audience and the basic benchmark to compare ad costs. The actual price of a 30-second spot this year is $3 million.) Critic Bob Garfield of Ad Age puzzles over why advertisers continue to throw money in “pursuit of an extravagant, terrible commercial,” but one hint comes from Vinny Warren, who led development of several Super Bowl commercials. Warren writes in Adweek “the Super Bowl is special because everyone watches it. You, your grandma, your youngest cousin. We all tune in. Last year, 97.5 million people watched the Giants beat the then-undefeated Patriots.” Young consumers look up from the internet, and older affluent homeowners put down the DVR button and stop skipping commercials. Trouble is, the internet may eventually threaten even this mass-appeal model. Clever brands such as E*Trade are leveraging online communications to broaden the impact of their spots; the E*Trade talking baby trader now has a Twitter account and you can watch his video outtakes here. But other companies are feeling the pressure to issue previews of their spots, which may take some of the buzz out of them. We already have images of what Bridgestone, Miller, and Pixar will do. We know Tom Hanks will pitch the upcoming Dan Brown movie sequel and that GoDaddy.com will show two women in a shower. One Twitter page now has an ongoing stream of Super Bowl ad leaks. Super Bowl ads still work. But if you give them away for free beforehand, will advertisers keep on paying to play? We read once that human eyes lose their sensitivity to color over time, which is why memories of the green grass and blue sky from your toddler days seem so, well, green and blue. Fading eyesight explains why old people in Florida wear plaid pants, and perhaps why U.S. sports fans have now become dolts that watch 3-D television projections of the game while they sit in the very stadiums in which the game is being played. Now we certainly don’t mean to offend anyone who enjoys watching people in spandex bump into each other; in some countries that is not tolerated but here in America we call it football. Our point: The emergence of cheap, giant-screen, flat-panel screens is starting to encroach on reality. Panasonic chief Toshihiro Sakamoto opened CES this year with a 150-inch plasma called, fittingly, the Life Screen — not to be confused with the Life Wall, another Panasonic treat that covers entire walls of a consumer’s home. (Imagine it: “Honey, I told you to turn off that wallpaper!”) Light-bulb-maker Philips has been playing with screens that intercept reality via clear glass, so you can look outside a window or wave your hand to grow a shade tree to block the neighbor’s view. No real news here except the fakery of colored images has been arriving for a while; U.S. office workers spend one-third of each day in front of a screen moving numbers and words around, then drive home to watch the tube. The Super Bowl is almost here and consumers are talking more about the upcoming ads, to be shown on screens, than the game itself. The players meanwhile will dance around a moving yellow line on the field that doesn’t really exist, except for video projection and GPS camera technology giving fans at home a clear view of where the ball needs to go. Reality, it was lovely; we’ll miss you when you’re gone.